Every afternoon, anywhere in America: people race to fast food joints and supermarket deli counters. Their bounty – stress-eaten at their desk, eyes on the computer screen – is high in fat and calories, not to mention packaging. Utopia knows a few alternatives for a good and healthy lunch. One third of our life is spent at work and every third meal is eaten there – typically lunch. Yet it is rarely a good, healthy, or sustainable repast. A common complaint is that it is difficult to feed ourselves well in the modern workplace. Our short lunch break leads us to make bad decisions: too little time means we take whatever’s closest. This leads us down a typically unhealthy path: readymade snacks from the supermarket, or junk food like burgers, hot dogs, or pizza. Here are five tips to improve the overall quality of your lunch break. The key to a more sustainable lunch break is avoiding the prepackaged snack trap, meaning anything from the supermarket packed in disposables like aluminum or plastic intended for immediate consumption. Cut fruit in plastic containers and premixed salads in their own bowls are just two bad examples. Store-cut fruit, bagged salads, and aging sushi rolls should also be avoided – both for their higher risk of causing food poisoning and the reduction of their nutritional value via extended exposure. Pay attention not only to the snack itself, but also to the packaging it comes in: less is more, meaning a sandwich wrapped in paper is typically more sustainable than cut fruit in a plastic container. Instead of ordering your next coffee to go, why not take a seat in the cafe and enjoy your break in peace? Even better: pack your own snacks to go in reusable containers. 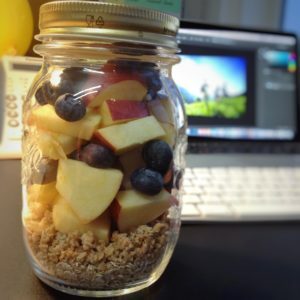 2. Who Needs a Lunch Box When You Have a Jar? Raw veggie sticks have no trouble staying fresh till lunchtime. If raw foods are too hard to digest, you can steam or fry almost anything – cooking will even improve the flavor of certain vegetables. Cooked vegetables will also keep until lunch without a problem. Jars are ideal for summer fruits and berries. But beware: fruit alone will not keep you full long. Fruit comprises just one element of a balanced lunch. Salads: tomatoes and mozzarella, hummus and veggies – there are plenty of dishes best enjoyed cold that can fit in a jar. Legumes: lentils, beans, chickpeas, and other legumes are a compact source of protein to keep your midday hunger in check. Pickles: DIY pickling – from two-day refrigerator recipes to homemade sauerkraut or kimchi – relies on lactobacillus, which aids digestion. If you don’t have time to make your own, fill your jar once per week at the deli or market and eat a portion every day. Each season, different fruits and vegetables are available regionally, ensuring a wide variety in your diet. Before buying new, find canning jars at rummage sales or secondhand shops; you can also just reuse any large glass jars passing through your kitchen as packaging for other foods. Of course it sounds like a more efficient use of time – review or edit something quickly or even read Utopia articles while noshing your lunch in front of your computer. But it’s not as sensible as it seems: your eyes need a break, too! And when we read and eat, we’re not consuming our food consciously, making us more likely to overeat while distracted. So in the end, it’s better to hit the break room and chat with colleagues or find a sunny spot outside the office for those few minutes of freedom. Without a doubt, those who do physical labor all day need physical rest in order to recover. But desk jockeys who spend their entire day in the same seated position are more likely to need a break from all that sitting – ergo exercise. So use your break to take a long walk, with a sandwich pause on a bench at the halfway mark. Today we require every minute to be productive lest it be wasted, listening to informative podcasts or learning foreign languages while munching. Yet even the direct opposite can be just as useful for productivity: the chided midday siesta. You can sneak a quick nap in the break room or a park bench. 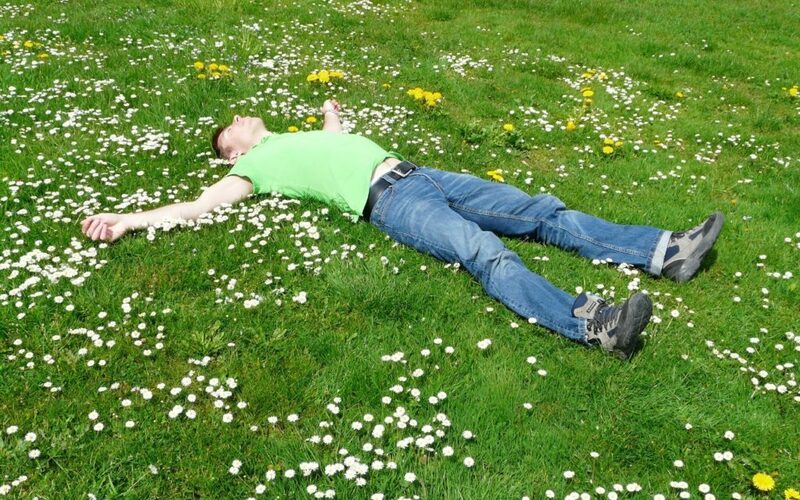 “Nap” here is defined broadly: doing nothing for twenty minutes beyond simply existing – there’s perhaps nothing more relaxing than that. It’s clear that every tip cannot be integrated into every schedule – but even a small improvement or two can elevate us beyond quickie burgers and fountain sodas, no? Do you have further tips for making your lunch break healthy, more sustainable, and more restful? Share with us in the comments!